One of the most common alternative treatments for sleep apnea is acupuncture. But a lot of patients are still skeptical about this “oriental” therapy because it seems unbelievable that tiny, painless needles strategically inserted into the body can actually help cure a condition of such magnitude. Does Acupuncture for Sleep Apnea Really Work? According to an increasing amount of scientific evidence, yes, acupuncture can cure (or significantly reduce) obstructive sleep apnea. In one study consisting of 26 people afflicted with moderate sleep apnea, researchers compared the results among three groups: the acupuncture group, the placebo acupuncture group (where the participants were pricked with needles but without the proper technique or knowledge of acupuncture), and a control group. It was found that participants in the acupuncture group, after 10 weeks of treatment, showed major improvements (around 50%) compared to the other two groups. Read more on this study here. In another study which compared manual acupuncture and electro-acupuncture and their immediate effect on sleep patterns of patients with sleep apnea, it was found that both type of acupuncture methods contributed significantly in helping patients sleep better and prevent hypopnea (shallow breathing) episodes. You can learn more about the study here. While these studies only involved a small group of subjects, their results give hope to sufferers of sleep apnea that acupuncture can help alleviate its symptoms. 1) Patients with mild or moderate sleep apnea who are not overweight or are actively losing weight. 2) Patients who do not have sleep apnea caused by physical obstruction of the airways (such as those caused by a deviated septum, etc.) . 3) Patients who do not have other major health conditions such as diabetes, hemophilia, heart disease, and cancer. 4) Women who aren’t pregnant or breastfeeding. 5) Adults and adolescents (children may feel uncomfortable and restless during acupuncture). The points above only serve as guidelines; it is up to your acupuncturist to decide if you are a good candidate for the treatment. How Does Acupuncture Cure Sleep Apnea, Exactly? Acupuncturists believe that the body is one with nature, and thus everyone has streams and rivers within the body, similar to Mother Nature. Instead of water though, the body’s “streams” (known as meridians) contain energy (known as “qi,” and pronounced as “chee”) which flows in a particular way through the body. If this flow encounters resistance or is interrupted, illness ensues as the body’s balance is thrown off. Acupuncture restores the patient’s healthy sleep patterns by relaxing the nervous system and increasing the production of serotonin by the body, a substance that promotes better sleep. Acupuncture also helps keep the upper airways open by stimulating and strengthening the muscles of the airway that usually collapse when the patient has an episode of sleep apnea. You should never undergo a sleep apnea treatment without preparing yourself first. To learn everything you need to know about acupuncture therapy for sleep apnea, please check out this essential guide: Cure Your Sleep Apnea With Acupuncture. Interested in learning more about acupuncture therapy for sleep apnea? 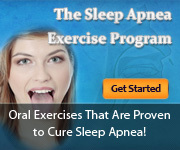 Please click here to get “Acupuncture for Sleep Apnea Program”.